Resistance measurements in the range above 100 Ω are generally made using the 2-wire method shown in the following figure. The excitation current flows through the leads and the unknown resistance, Rmeas. 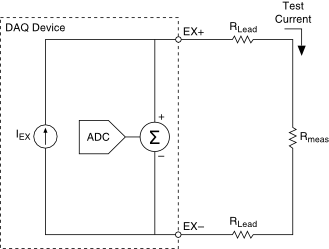 Your device measures the voltage across the resistance through the same set of leads and computes the resistance accordingly. Errors in the 2-wire measurements are introduced by the lead resistance, RLead, when measuring lower resistances. Because there is a voltage drop across the lead resistance equal to I × RLead, the voltage measured by your device is not exactly the same as the voltage across the resistance, Rmeas. Because typical lead resistances lie in the range of 0.01–1 Ω, accurate 2-wire resistance measurements are very difficult to obtain if Rmeas is below 100 Ω.